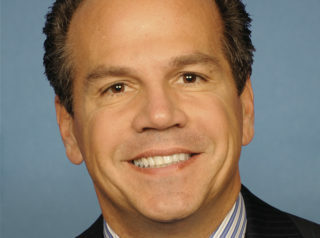 David N. Cicilline was born on July 15, 1961, in Providence, Rhode Island. After earning a B.A. in political science from Brown University in 1983 and a J.D. from the Georgetown University Law Center in 1986, he worked as a public defender in the District of Columbia during 1986-87. Cicilline then returned to Rhode Island to practice law. In 1994 he began an eight-year stint as a Democratic member of the Rhode Island House of Representatives. From 2002-10 he served as mayor of Providence. And in 2010, voters in Rhode Island’s 1st Congressional District elected him to the U.S. House of Representatives, where he continues to serve as a member of the Congressional Progressive Caucus. In his 2010 congressional run, Cicilline had to work hard to overcome questions that arose about the character flaws of some people who were particularly close to him. For example, his former police driver was arrested for participating in a cocaine dealing ring, and Cicilline’s brother had recently served a federal prison term for a courthouse corruption scheme. Like many Democrats, Cicilline has received support for his political pursuits from some high-profile members of the entertainment industry. In February 2011, for instance, he held a fundraiser at a Lady Gaga concert. An unwavering foe of Voter ID laws, Cicilline in November 2011 signed a letter to Rhode Island Secretary of State A. Ralph Mollis, urging him to oppose the “disturbing trend” of “partisan plays” where “identification requirements” and “voter registration regulation” were being “used as weapons to achieve a preferred electoral outcome.” Four years later, Cicilline introduced legislation designed to automatically register people as voters when they got their driver’s licenses through the Department of Motor Vehicles. In stark contrast to most congressional Democrats, Cicilline in 2012 made his support for President Barack Obama’s policies—many of which had proven to be deeply flawed and highly unpopular—a focal point of his campaign. Given the heavily Democratic composition of his voting district, however, this strategy never posed even the slightest threat to Cicilline’s chances for re-election. In October 2013, Cicilline participated in a “No Cuts” rally that the Congressional Progressive Caucus hosted outside the U.S. Capitol. There, Cicilline and his political allies joined hands with citizen demonstrators to form a “human chain” in opposition to any budgetary cuts to Social Security, Medicare, or Medicaid benefits. In 2014 Cicilline supported President Obama‘s decision to re-establish diplomatic ties with Communist Cuba. In February 2015, Cicilline was part of the first official House delegation to meet with Cuban government officials under the new policy. Cicilline contends that Congress must address America’s “broken” immigration system by passing “comprehensive” reforms that will “help approximately 11 million undocumented immigrants emerge from the shadows” and pursue “a responsible path to citizenship.” Such reforms, he says, could “help businesses expand, foster innovation, increase productivity, contribute to long term wage growth,… help create more than 100,000 jobs every year … [and] reduce our national deficit by more than $800 billion over the next decade.” In January 2015, Cicilline joined Rep. Luis Gutierrez and a number of local leaders at the Providence Career and Technical Academy in Rhode Island for an “immigration forum” designed to educate illegal immigrants on how they could best take advantage of President Obama’s recently enacted executive amnesty orders—i.e., “Deferred Action for Childhood Arrivals” (DACA) and “Deferred Action for Parental Accountability” (DAPA)—which together shielded millions of illegals from potential deportation. In September 2015, Cicilline led a group of 72 House Democrats in composing a letter demanding that the Obama Administration “resettle a minimum of 200,000 [Middle Eastern] refugees by the end of 2016, including 100,000 Syrian refugees”—a figure many times higher than the 10,000 who were originally slated for designation as refugees. “It is our moral duty, as a nation founded on the principles of equality and freedom, to do what we can to assist our brethren who are in desperate turmoil, and are searching for the slightest gesture of goodwill,” wrote Cicilline and his colleagues. Also in 2015, Cicilline co-sponsored Rep. Rosa DeLauro‘s “Support Assault Firearm Elimination and Education of our Streets Act,” a national gun-buyback program offering tax breaks to anyone who voluntarily surrendered their “assault weapons.” For a list of this bill’s additional co-sponsors, click here. For an overview of Cicilline’s voting record and policy positions on a variety of key issues during his years in Congress, click here. Further Reading: “David Cicilline” (Ballotpedia.org, Votesmart.org, & Keywiki.org); “R.I. Mayor Faces Questions in Congressional Run” (Newsmax, 3-7-2010); “Langevin, Cicilline Sign Letter Opposing Voter ID Laws” (GoLocalProv.com, 11-9-2011); “Democrats Introduce Universal Voter Registration Bill in House” (DailyKos.com, 6-11-2015); “House Dems Call for 10-Fold Increase of Syrian Refugees” (The Hill, 9-11-2015). “David Cicilline on Immigration” (OnTheIssues.org); “Immigration Reform” (Cicilline.com); “Luis Gutierrez to Kick Off Nationwide Exec Amnesty Education Tour in Rhode Island” (Breitbart.com, 1-2-2015).